Visitors to Ocracoke Island won't have too much trouble exploring the area. With 16 miles of undeveloped and completely pristine beaches, bordered to the north by a 4-square mile village that encircles the Ocracoke Harbor, it doesn't take long for most vacationers to figure out their way around town. That said, it is helpful to get a quick overview on the Ocracoke lifestyle, town regulations, and special points of interest, which is why a trip to the Ocracoke Island Visitors Center may be a helpful stop during a weeklong vacation or even a day trip. The Ocracoke Island Visitors Center is tucked away at the very edge of Ocracoke Village, at the southern end of NC Highway 12. 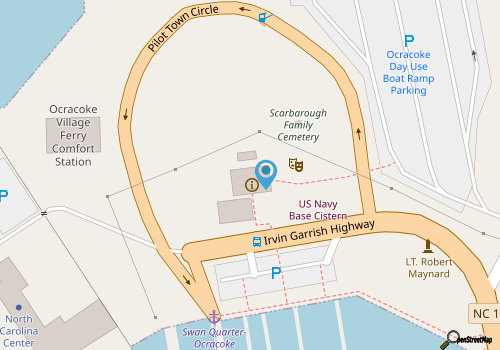 While it might be initially hard to find if you're not looking for it, folks who are waiting for the Swan Quarter or Cedar Island Ferry will almost certainly see it and stop in, as it is located almost directly next to rows of ferry lanes. The Visitors Center is managed and manned by the National Park Service (NPS.) The beaches of Ocracoke Island are part of the Cape Hatteras National Seashore, and as such, the NPS has a large presence on the island, patrolling the beaches, maintaining the Ocracoke Island Lighthouse, and managing the famous Ocracoke Pony Pen. Because of this, the Ocracoke Visitors Center has a wide range of information on some of Ocracoke Island's most recognized and beloved attractions. Visitors to the small center will find exhibits on the British Cemetery and the island's role in World War I and II, the wild Ocracoke Ponies, the lighthouses on Hatteras and Ocracoke Islands, and the rich history of pirates on the NC coastline, including the most famous Ocracoke visitor of all time, Blackbeard. In addition to this small selection of exhibits, the Visitors Center also features a book store and gift shop which carries all things Outer Banks. Here, vacationers can find local guide books and field guides, famous local fiction and non-fiction works, and a wide variety of children's books, many penned by local island authors. In addition to the treasure trove of books, visitors will also find postcards, caps, T-shirts, posters, puzzles, and other small trinkets to take home. There are also a number of local pamphlets, brochures, and catalogs available for nearby Ocracoke accommodations, restaurants, shops, and attractions. For newcomers to Ocracoke Island, the Visitors Center has a wealth of information on where to go and what to see once they have arrived. The Visitors Center is also the launching point for a number of National Park Service sponsored programs for both adults and kids, which are open to the public and are usually free. Examples of classes and programs available include crabbing classes for kids, sea turtle educational sessions, "Fish with a Ranger" Days, and even "Junior Ranger" Days where kids can see what it's like to work within the National Seashore. Some programs may have a small fee, and some may also require reservations due to a limited number of spots available. For more information on upcoming events and NPS sponsored educational programs, visit the Cape Hatteras National Seashore's website's events page here. The series of seasonal programs generally only run from March until October, (with occasional special sessions that coincide with holidays or special events), however the Visitors Center is open every day except for Christmas. Directly behind the Visitors Center, explorers and strollers will find a small sandy path that leads behind the cluster of buildings to a slightly rocky and slightly sandy harbor front beach. Rarely visited, explorers who stumble upon this spot often startle a blue heron or an egret, or one of Ocracoke's famous feral cats who love this area for the superb bait fish hunting grounds. Take a closer look, and visitors may even spot hermit crabs or small clusters of oysters located at the very edge of the water. If nothing else, it's a fantastic spot to sit for a bit, watch the ferries, boats, and kiteboarders glide by, and enjoy the fantastic waterfront views that Ocracoke is known for. Visitors who simply head to the beaches past the village itself will find another smaller Visitors Center, also managed by the National Park Service, and located just a couple miles outside town adjacent to the NPS campground. 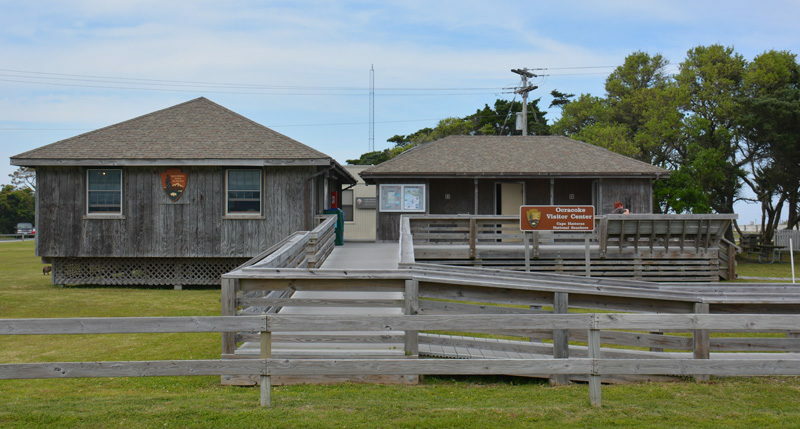 This small station usually has a ranger on duty in the summer months to answer questions, as well as public restrooms, an area map, and a few pamphlets on Cape Hatteras National Seashore rules and guidelines. 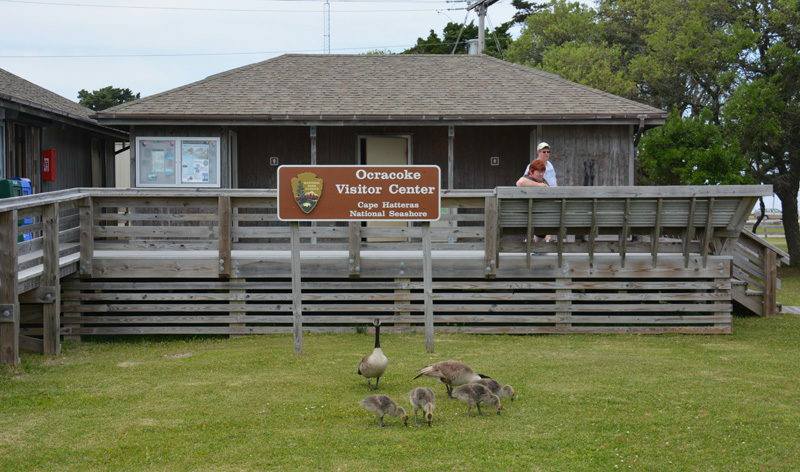 Whether you are embarking on a true Ocracoke vacation for a week or two, or simply passing through on your way on or off the Outer Banks, the Ocracoke Visitors Center and the surrounding grounds are certainly worth a stop. Packed with information and friendly staff, secluded waterfront beaches, and even drinks and snacks to tide you over on a long ferry ride, a quick trip to the Ocracoke Visitors Center is an ideal way to start off on an Outer Banks adventure.